First recipe of the year! And I think it's only fitting for it to be a lovely breakfast recipe. I made this chocolate berry granola after the success of my matcha granola, when I was feeling enthusiastic to come up with new flavour combinations! This one is pretty similar in structure to the matcha granola, with cocoa powder replacing the matcha, and a few little tweaks to the add ins. I wanted to call this my açaí-chocolate granola, but looking at the packet, there's only 2% açaí extract in that chocolate bar, so I think it would be a bit cheeky to call this an açaí granola! (Although if you're feeling flush with cash, feel free to buy some açaí powder and stir a tablespoon through before baking). If you've got all the ingredients, it's quite quick to make - another reason I made this was to use up all these half-packets of nuts and seeds I had in my pantry. 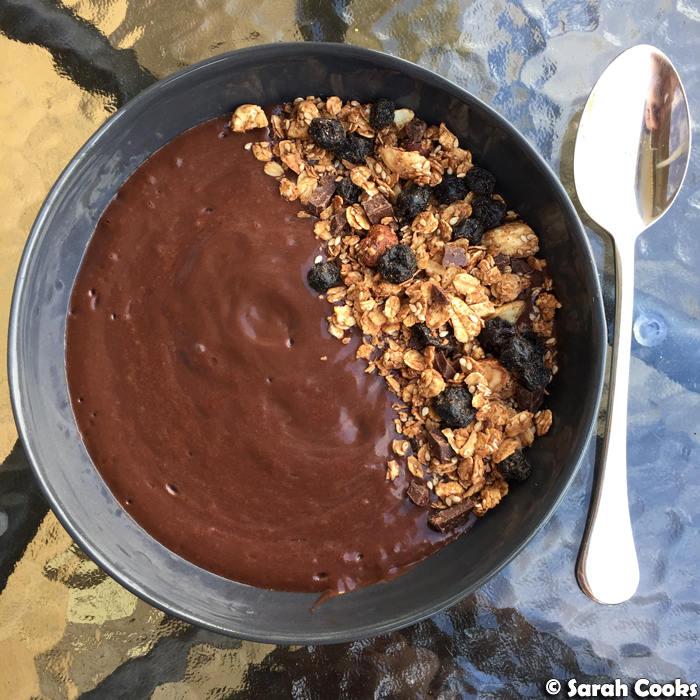 My crunchy add-ins were hazelnuts and cacao nibs (to enhance the chocolate flavour), and cashews for a bit of a tropical vibe to match the acai. I do love the muted chocolate flavour you get from the cocoa throughout the granola, punctuated by the intense dark chocolatey pops of the finely chopped chocolate, not to mention the delicious tang of the dried blueberries. (I feel that blueberries are like acai's less-intense berry cousin, very appropriate here). 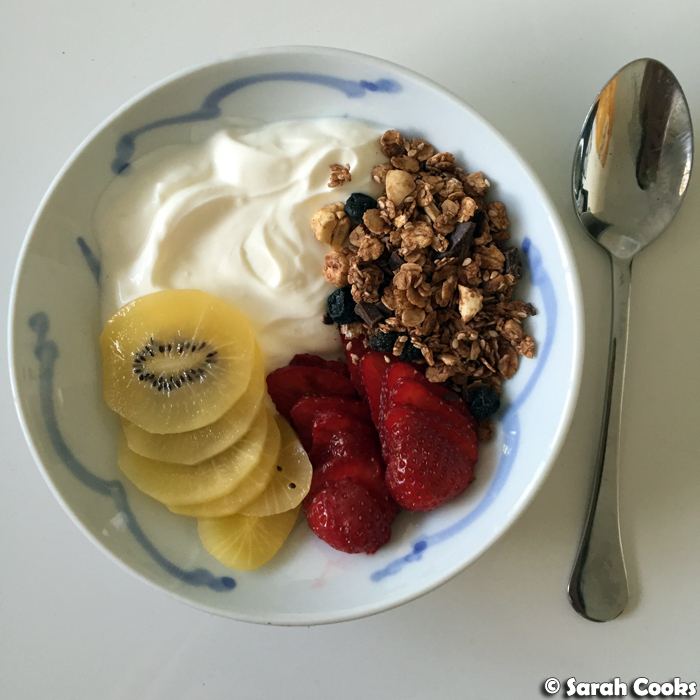 I've been enjoying this delicious granola for breakfast - on yogurt, on açaí bowls - or even as a snack. Its sweet crunchiness really brightens up my day! Enjoy. Line a large baking tray with baking paper. 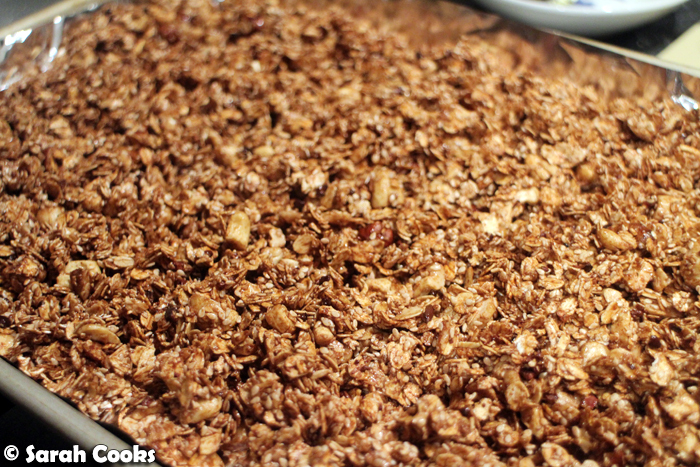 Place the oats in the tray and bake for 20 minutes, stirring once or twice during the baking time. Remove the tray from the oven and allow to cool. (Leave the oven on). You can leave the oats in the tray, or transfer them to a mixing bowl to cool faster. 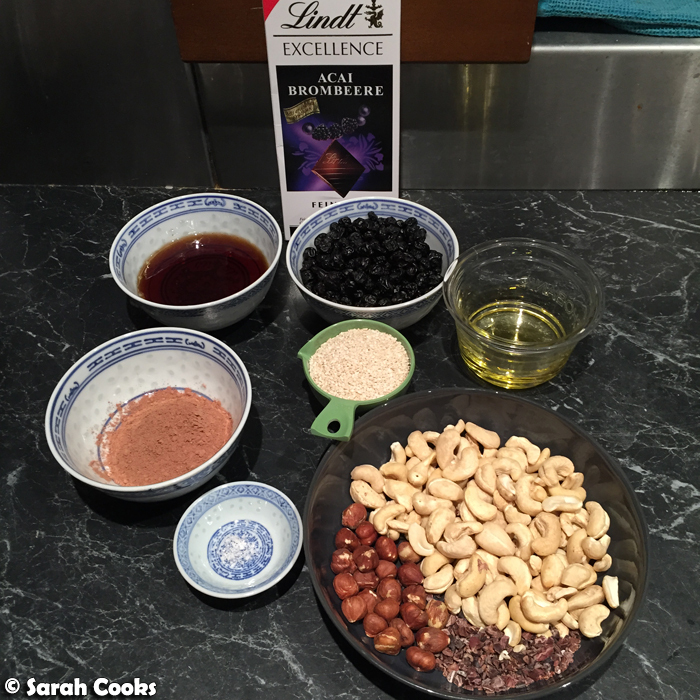 Either way, add the mixed nuts and seeds, sesame seeds and cocoa powder to the oats, and stir together to combine evenly. Add the vegetable oil, maple syrup and salt, and mix well. Return to the oven and bake for 20-30 minutes, until dried but not browned. Give the mixture a stir every 10 minutes. 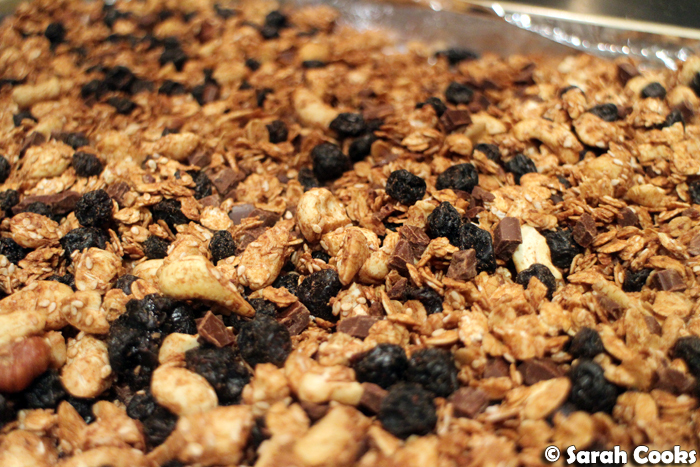 Allow the mixture to cool completely, then stir in the chocolate and dried blueberries. Store in an airtight container. 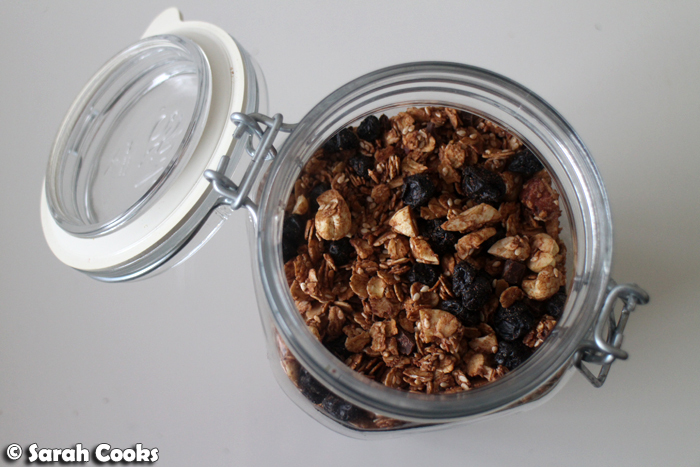 I definitely need to get my granola on! Chocolate chunks for my breakfast sounds like my kinda deal!